To realize preventive and personalized medicine, large numbers of consumers must pool health information to create datasets that can be analyzed for wellness and disease trends. To date, consumers have been reluctant to share personal health information for a variety of reasons. To explore how financial rewards may influence data sharing, the concept of Markets of Data (MoDAT) is applied to health information. Results from a global online survey show that a previously uncovered group of consumers exists who are willing to sell their de-identified personal health information. Incorporating this information into existing health research databases has the potential to improve healthcare worldwide. During the presentation, I argued that patient populations for both rare and common diseases can look similar, especially when looking at disease subtypes. When considering relatively common diseases such as diabetes, schizophrenia, and autism spectrum disorders, a single hospital in the U.S. will not see enough patients for a given disease subtype to make meaningful conclusions. On average, U.S.-based hospitals do not have enough patients to solve disease questions without sharing health information. For this survey, a global panel of 400 participants was selected at random by AYTM, an online market research tool. 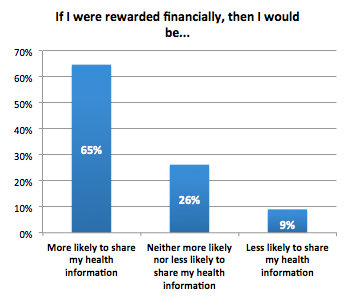 Questions were based on a previous health information sharing survey, with additional questions about sharing with financial reward. I received 400 responses from 59 countries in less than two hours. U.S.-based respondents overwhelming believed that their health information was worth more than $1000, but the global average was around $250 when the U.S. was excluded. For these participants, both their motivation and the amount of data shared increased with financial reward. Keep in mind that these participants were paid to respond to the survey, so they represent a kind of self-selected group. Nevertheless, monetizing health information sharing produced a surprising result, demonstrating that an alternative source of health information may exist for research purposes. This entry was posted in GenomeDad Blog and tagged genomics, health information, health sciences, personalized medicine, preventive medicine on December 20, 2014 by ktpickard. The consent form also includes lets the patient opt-in so that IIHG can use patients’ genetic information in future research studies (beyond the original purpose for the test). IIHG has done an exemplary job involving an entire community to integrate genomics into clinical practice. 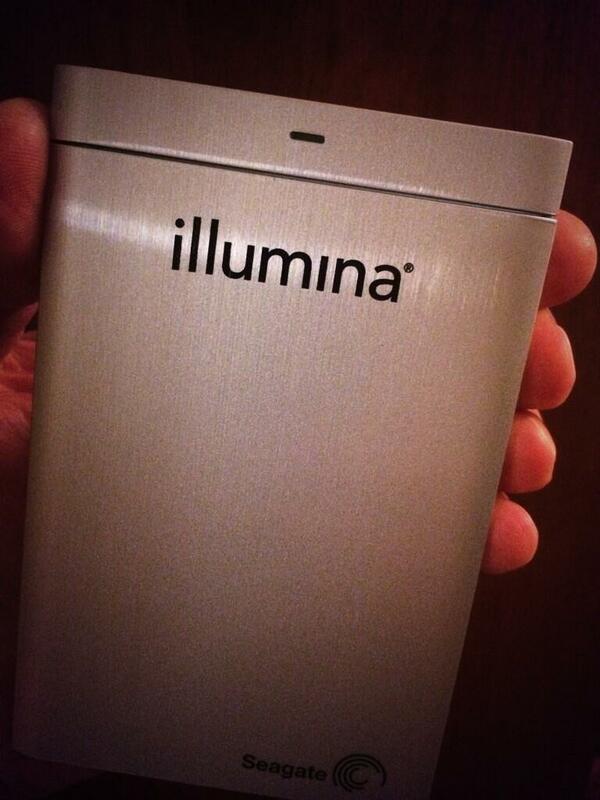 By educating hospital staff, patients and the community, genomic medicine will slowly begin to take root. Note: I would not be surprised to see IIHG presenting their results at conferences over the next year, including AHIMA, AMIA, ANIA, ASHG and HIMSS. This entry was posted in GenomeDad Blog and tagged exome sequencing, genetic testing, genomic medicine, informed consent, Iowa Institute of Human Genetics on July 15, 2014 by ktpickard. Sharing personal health information is essential to create next generation healthcare services. To realize preventive and personalized medicine, large numbers of consumers must pool health information to create datasets that can be analyzed for wellness and disease trends. Incorporating this information will not only empower consumers, but also enable health systems to improve patient care. To date, consumers have been reluctant to share personal health information for a variety of reasons, but attitudes are shifting. Results from an online survey demonstrate a strong willingness to share health information for research purposes. Building on these results, the authors present a framework to increase health information sharing based on trust, motivation, community, and informed consent. 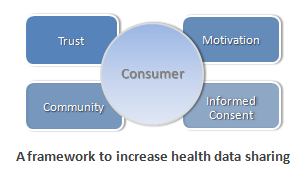 Consumers are willing to share health data under the right conditions. Education seems to play a strong role. Consumers want to be connected to their data. Develop models to encourage sharing. The survey is ongoing! It takes just five minutes, so please add your voice here. This entry was posted in GenomeDad Blog and tagged genomics, health information, health sciences, personalized medicine, preventive medicine on March 27, 2014 by ktpickard. I will be presenting results from my second self-tracking study at the Quantified Self San Francisco meetup at Microsoft later tonight in San Francisco. By participating in this crowdsourced study on Genomera, I tested niacin supplementation as a potential treatment for Restless Legs Syndrome (RLS). This experiment had two main differences from the first one. First, I tapered off my current medication, clonazepam, after ramping up with niacin. Second, I increased the daily niacin dose from 500mg to 2000mg, which meant that the ramp-up was also much longer. I recorded some sliding scale measurements of RLS sensation, leg jerks, etc. in a spreadsheet (see above). Aggregated measurements are also available to Genomera’s members. Like the last experiment, niacin did not improve my RLS symptoms, even at the higher dose. However, RLS severity was less after tapering off clonazepam, perhaps due to the niacin. Since the first experiment, I also started taking an iron supplement to increase my ferritin level, which might also account for diminished RLS severity. As before, I saw my doctor after the experiment to discuss the results. We changed my medication to Mirapex, which is also commonly used to treat RLS. Compared to clonazepam, I feel more alert. The RLS symptoms remain under control, and amazingly, feeling returned to my sciatic nerve about one month ago–I can feel it all the way down to the top of my left big toe. I am unsure what this means, but after injuring my back 30 years ago it seems significant. Finally, I wanted to mention that my psoriasis flared once I started taking niacin at 2.0g/day. Subsequently, I read several articles discouraging psoriatics from taking large doses of niacin. Overall, this QS journey has been worth it. I learned more about my RLS, but more importantly, how to ask better questions that improved my health. This entry was posted in GenomeDad Blog and tagged niacin, quantified self, restless legs syndrome, RLS on December 5, 2012 by ktpickard. I will be adding more data to Synapse in the near future. This entry was posted in GenomeDad Blog and tagged #openmeddata, Sage Bionetworks on October 17, 2012 by ktpickard.